After the booze is all gone…. Let’s face it, we all like a little alcoholic beverage every once in a while. And haven’t you noticed that some of those alcoholic beverages come in the prettiest bottles? The question is what to do with them. Well, I turned mine into DIY liquor bottle soap dispenser. I don’t use the large liquor bottles though. I like to use the small glass ones, usually found behind the beverage store sales counter. [Read more…] about After the booze is all gone…. Whenever I travel home to Puerto Rico, one of the places I definitely go to when I am there are the local bakeries. 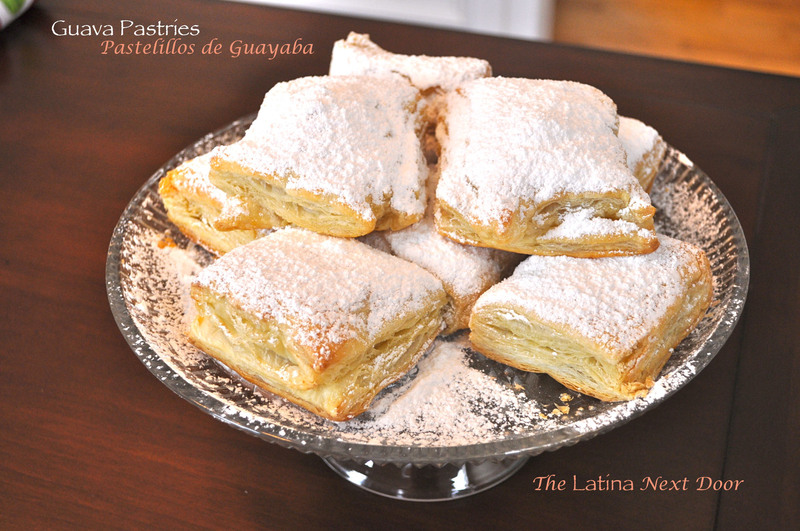 One of the items I always have to order are Pastelillos de Guayaba or Guava Pastries. I decided I really wanted to learn to make them for myself so that I didn’t have to wait for that yearly trip back home. And that is exactly what I did. They are so easy to make too! Just like from the bakery….. Filed Under: Food... Buen Provecho! One of the first things I wanted to fix when we moved in was the laundry room. It was yucky! 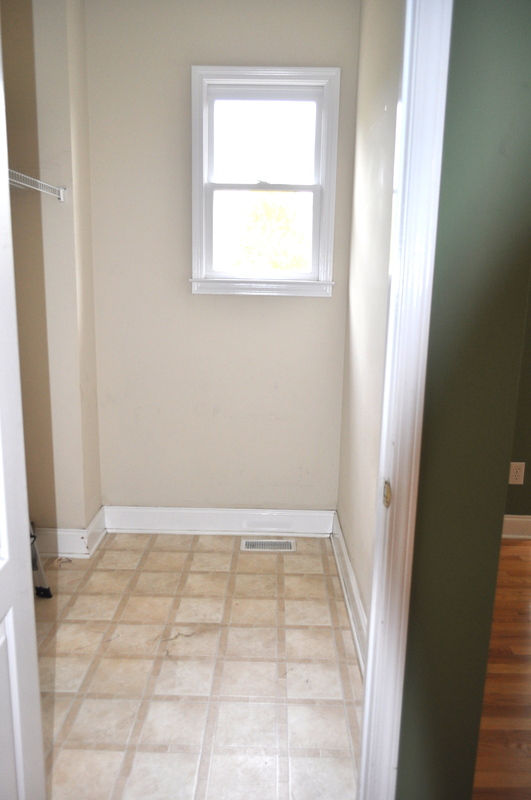 The walls were scuffed, the linoleum was torn and dirty, the baseboards were mucky, I could go on forever! So we opted to repair and clean it up a bit before anything else, since after all there was going to be a lot of cleaning going on in there. Plus the washing machine and dryer are heavy as hell! We didn’t want to move them back out and fix the room after-the-fact. 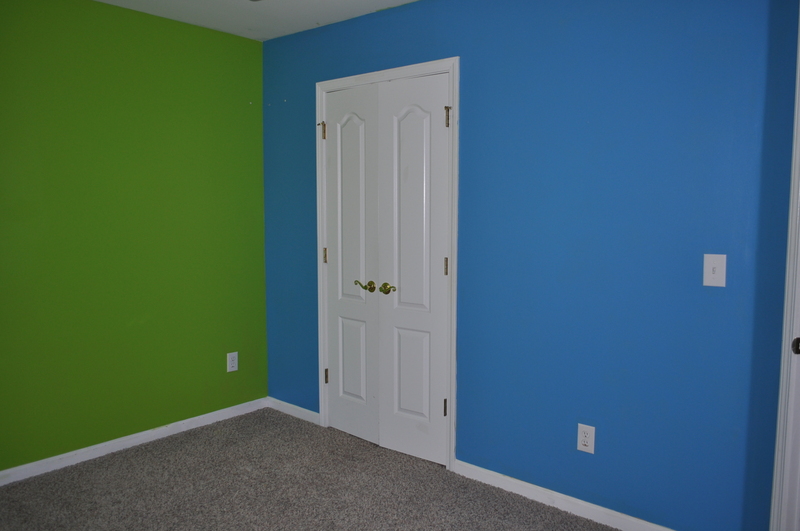 Here are the before pics…. [Read more…] about Dirty Laundry…. We have a rather large master bedroom (pictures coming soon) and I need to fill up my empty walls, so I have been sifting through the Hobby Lobby clearance aisles in search of some usable pieces of art and I came across these! 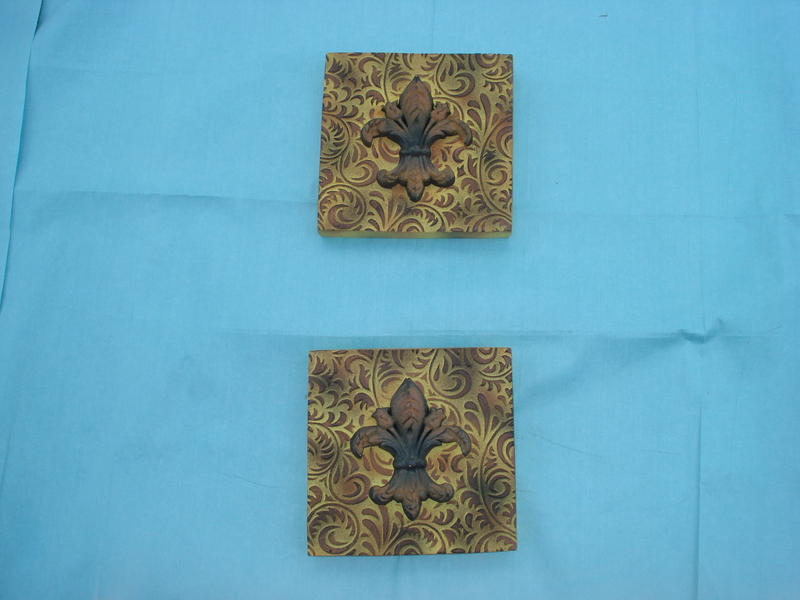 They measure about 12 x 12 inches and are made of resin so they aren’t heavy. They were on clearance for about $6 each (woot woot!). 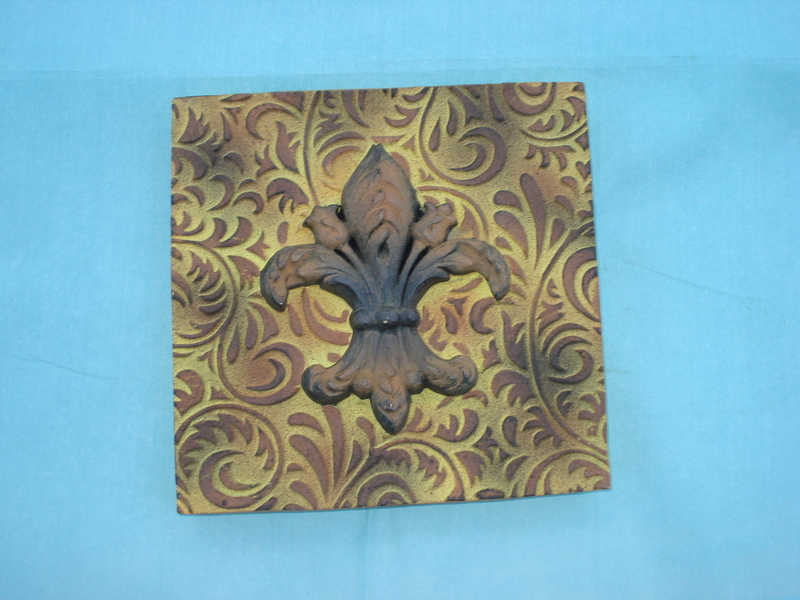 I love that they match well with my table top Fleur-de-Lis I fixed up last year. The pattern is raised so it has a lot of texture too. Well what can I say? 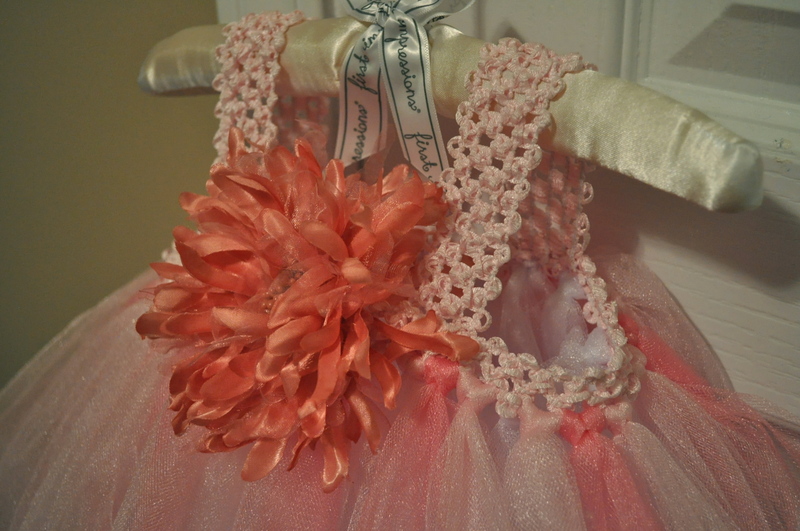 There is nothing more fun than creating absolutely girly stuff for my daughter, especially costumes. I figured, eventually she will be telling me what she wants to be so I took a stab at making her costume this year, something that mummy would like – see what I did there? I can’t get over how adorable it turned out! 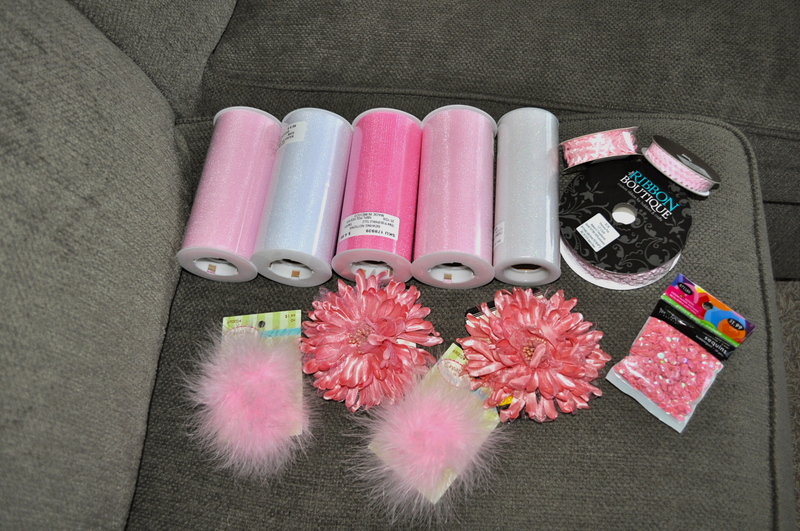 My supplies are above, but in the end, I only used one big flower, the 2 poofs, 3 spools of tulle and the headband elastic. The other stuff I returned. I did go back to get a pink onesie so that all that tulle wouldn’t itch so bad. The total tally came to about $20.00. Since I already made her one last year (step by step instructions are found here), this one was super easy to make! 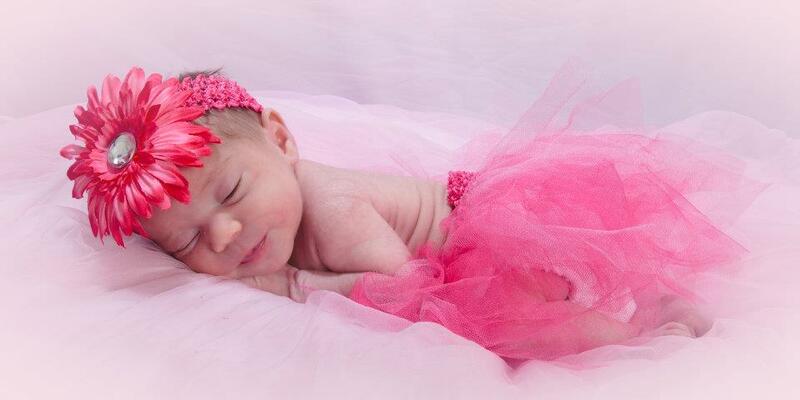 I cut the headband elastic to fit her chest and started adding long strips of tulle. Here is the first row.. complete in less than 10 minutes…. 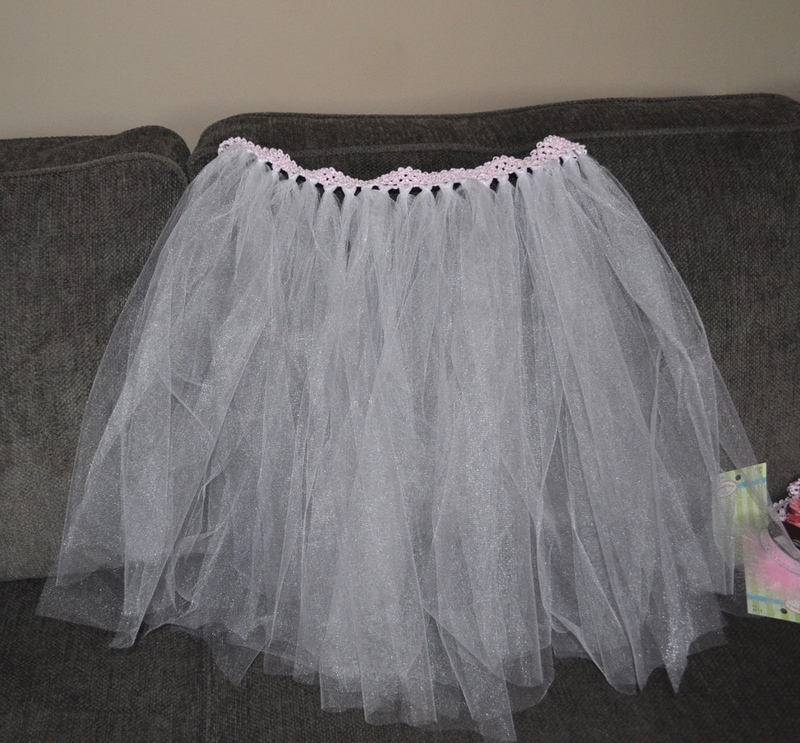 I started with the white tulle at the bottom. Then I added the light pink, then the darker pink on top…. Then, when I was done adding tulle, I sewed the 2 ends together by hand, and then cut 2 smaller headband pieces so that I could make her some shoulder straps. I sewed those by hand as well. The flowers and poofs were clip ons so those went on pretty easily. I chose not to glue them on because I could always use them for something else down the road. 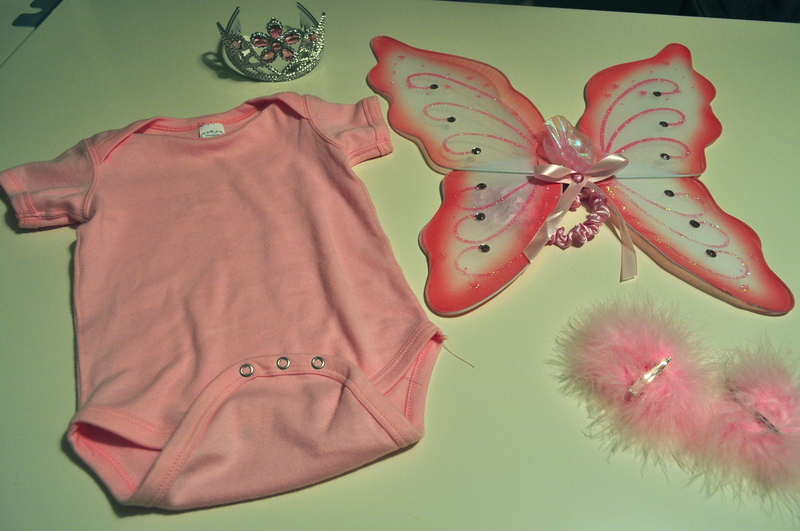 Here are the onesie, tiara and wings… a perfect match! And here is another shot of the kiddo with the costume, this time without the tiara, pacifier still on though! She will also wear pink leggings (which we already own) when we go out trick-or-treating along with some cute pink light-up shoes. She also has a pink sweater in case it gets chilly. 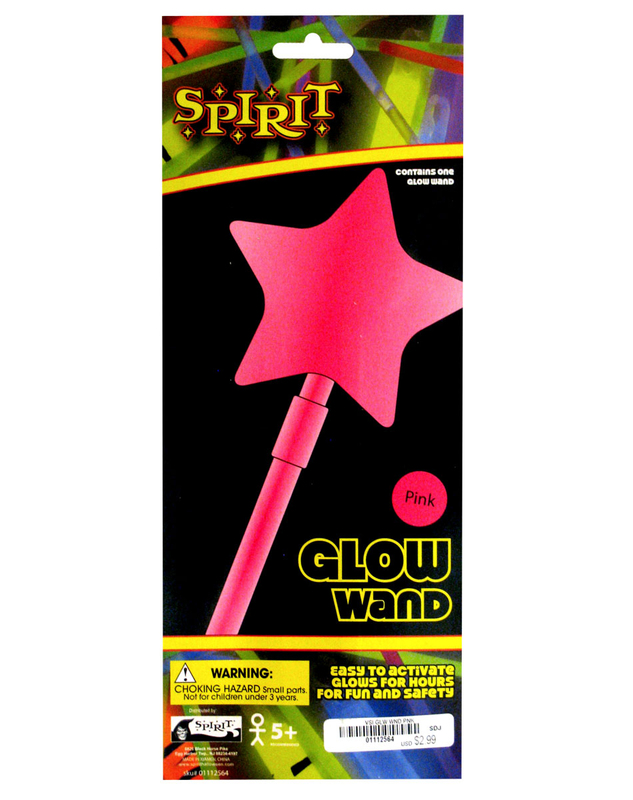 Her wand will be this really cool pink glow stick wand that I found at the dollar store, and yes you guessed it, for $1! In the end, what I love about this, besides that it’s the cutest costume EVER, is that several parts of the costume we already had, and everything can be reused differently later on. I know I could have bought a costume for the same price, but it wouldn’t have been this unique and in the end, it would only be used one time. I can appreciate a costume with versatility. Will you buy or purchase your kid’s costume this year? Now that we are a family of 4 and in a new home that is twice the size of our last, we have had to scale back, WAAAAAAY back on spending. But I totally love the holidays and want to enjoy them as much as I can with my little ones, so I want to be sure to do a little something. Plus, our neighborhood is actually pretty into the Halloween decorating thing and we didn’t want to be the new party pooper neighbors. We already had orange string lights that we purchased a long time ago so saved money on that! We also already had an electric jack-o-lantern that I have had for years so we were able to save money on not carving pumpkins – plus frankly we just hadn’t had the time. We wanted to take advantage of the porch and bushes so we bought 2 packs of cotton webbing for $1.47 each and started pulling it and placing it everywhere – we went a little cray-cray. I think our front entrance looks pretty cool now, especially with my new Halloween wreath. Instructions on how to make it and the total cost can be found here. We kinda like how it goes over the entrance. 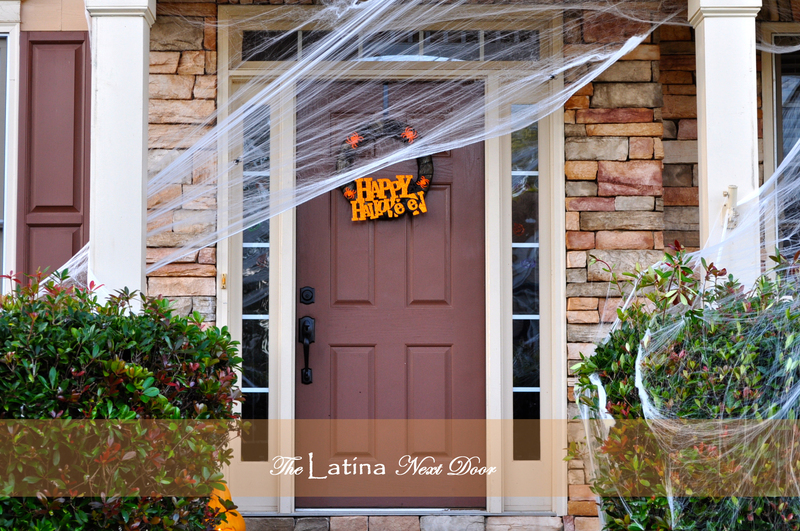 Some trick-or-treaters may have to duck to get through it, but we think it only adds to the spookiness. This is the view from further away (you can barely see the jack-o-lantern to the left of the door so I may be moving it to another location). The weekend after Halloween, we plan on going out to see the leftover clearance decorations and hopefully we could have more on hand for next year. We plan on adding ghosts, maybe tombstones or even big bugs. But I just thought I would share how much a $3.00 addition can impact the overall look, since a lot of people would rather spend the bigger dollars on Christmas decorations for example. In this case, the phrase “less is more” definitley applies. 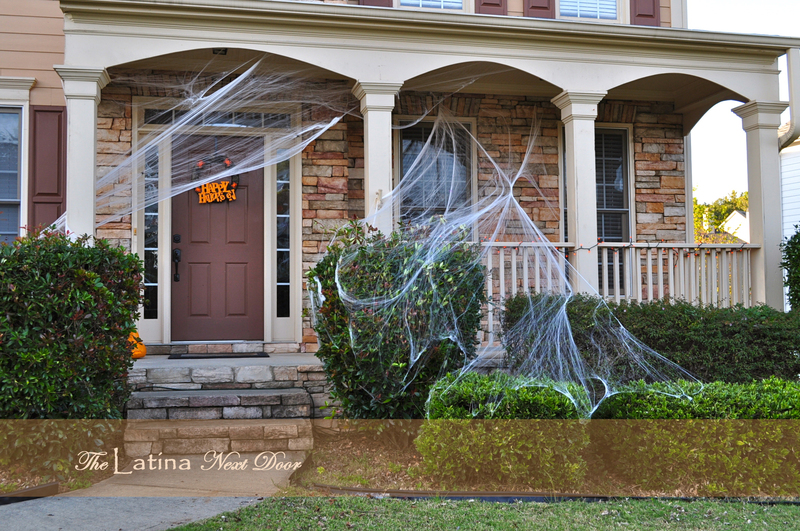 We’ll be adding more spider webbing next year for sure – we might even do the glow-in-the-dark kind! Filed Under: Crafts for the Home, For the Holidays! Let’s face it….Pinterest is as popular as Facebook nowadays and I am just as addicted to it as you are, yes YOU. There are always so many inventive things on there, I just can’t keep my eyes away – it’s a sad but oh so satisfying addiction. So, I thought it would be fun to start trying some of these things out to see if they actually work. I will say that one of my first attempts was a complete SUCCESS! 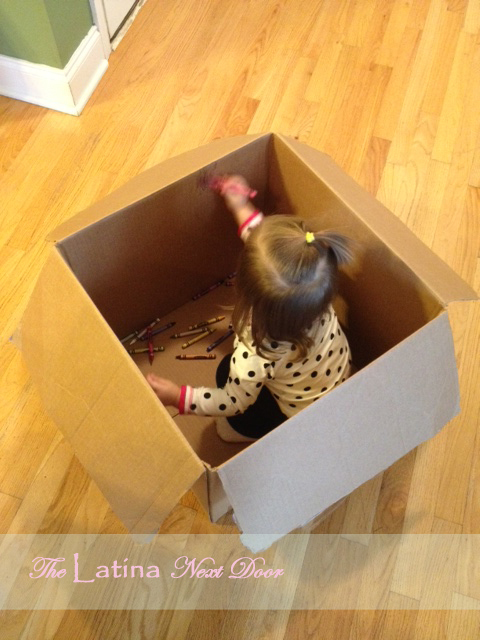 I saw a picture of a little boy in a cardboard box deeply lost in a coloring frenzy… the post read something like “How to keep a 2 year old busy”. I thought CLEARLY that would NEVER work with my 20 month old daughter who likes nothing but to be free as a butterfly all over the house. And when I say all over, I mean she truly likes to use every square inch of it. Well, in one of those I need to cook, do laundry while feeding the 3 month old baby brother, but big sister just wants to be held by mommy moments, I thought what the heck, it’s worth a try. Since we still have some unpacking to do I still have boxes around, so I got the first one I saw, brought it to the kitchen, threw some crayons in it and something magical happened. Look at that little hand go! I couldn’t take a still shot for the life of me! My 5 year old niece came down this past weekend and loved it too! Now I need a new box! Who knew right? A box and some crayons! It’s all good with this mommy! What keeps your little ones busy? I would love to know! Filed Under: Pin It to Me! 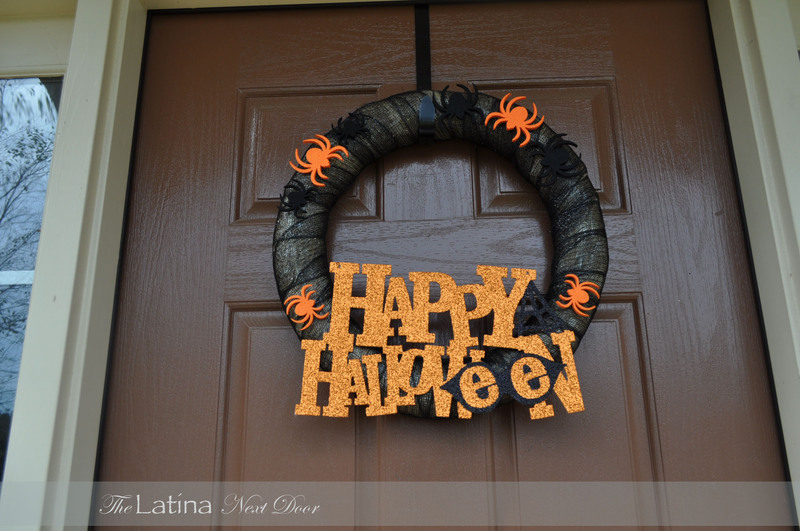 I wanted to make a cute Halloween wreath for our front door, but I wanted something cute, easy, and most of all affordable…. and this is what I came up with. 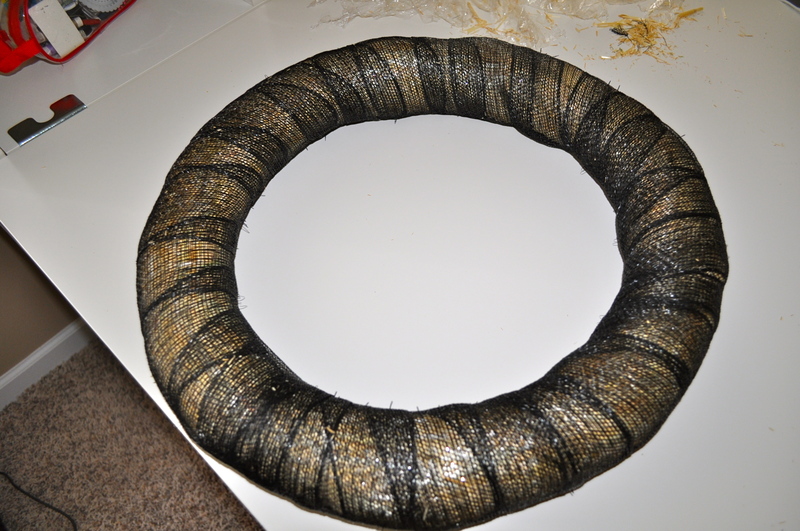 I glued one end of the ribbon on the back of the wreath and started wrapping it around until it looked like this. Yeah that ribbon was 40% off, gotta love Hobby Lobby! 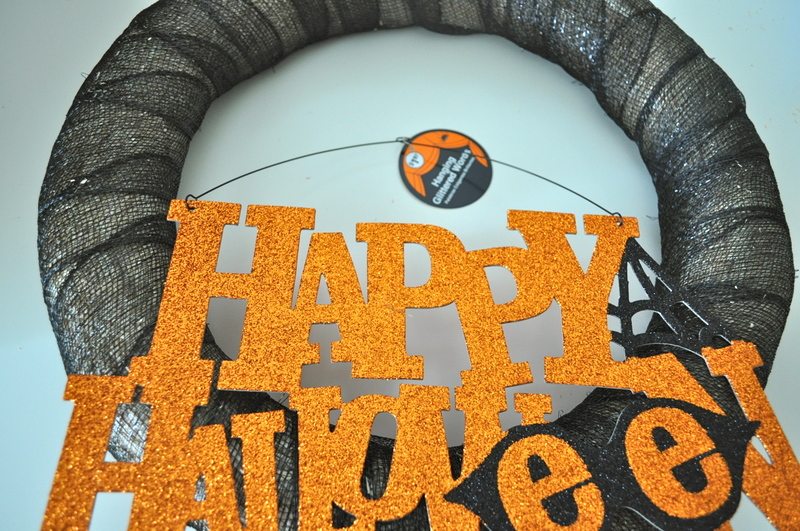 Then I centered this “Happy Halloween” door hanger that I bought at Wal Mart for $1.97. 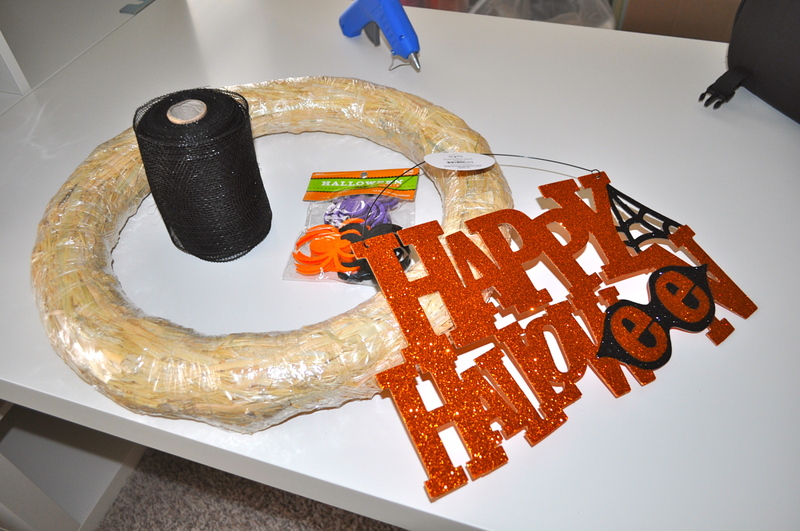 I removed the wire and hot glued it to the bottom of the wreath. Then I added some spiders from Hobby Lobby that were originally $2.99 but were already 40% off. I hot glued those babies too! And viola! 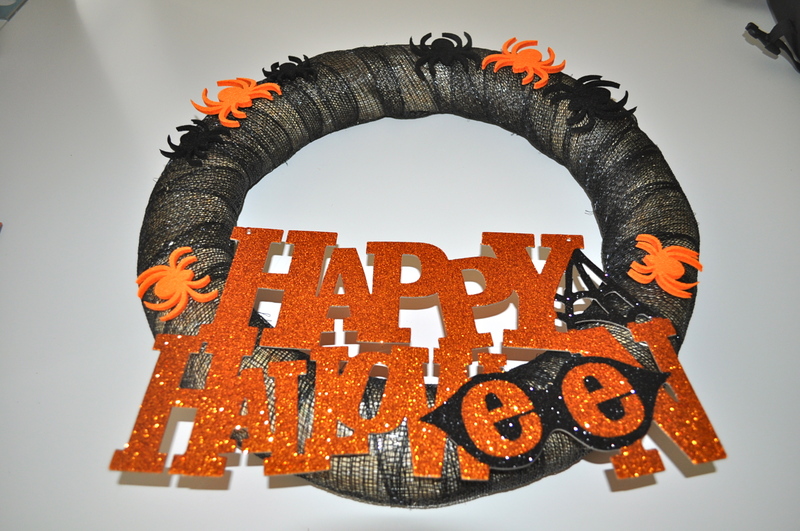 Instant Halloween Wreath! And it all cost me less than $12 and it took only 10 minutes to make! Gotta love that! Here it is again on my front door. Ignore the poopy brown color. That is another project down the road. 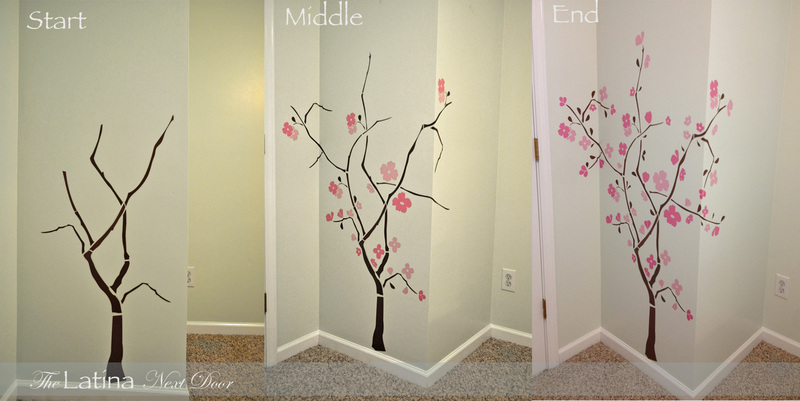 Can’t wait to paint my front door, but I will most likely do that in the Spring. Today is 10.10.13 and marks our 3 year wedding anniversary! I must say it has been an eventful time together with my hubby, Nelson, ever since we met 5 years ago. 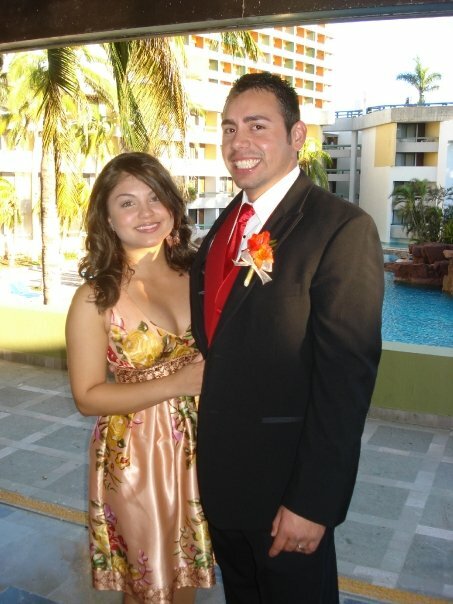 We got engaged October 2009 in the small town of Mazatlan, Mexico. This was actually before our engagement…. I HAD NO IDEA! 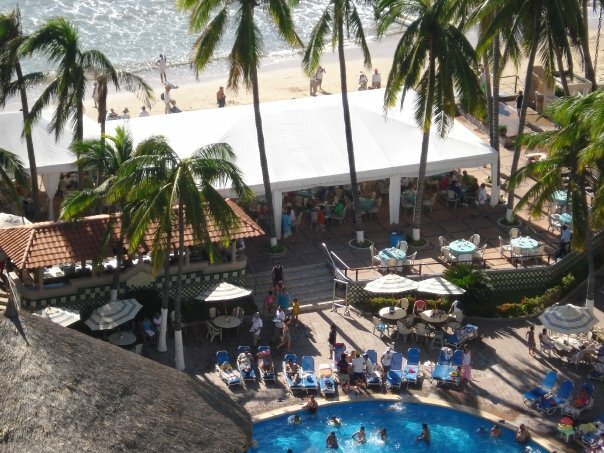 Here is the pool area where they served the BEST Pico de Gallo ever! 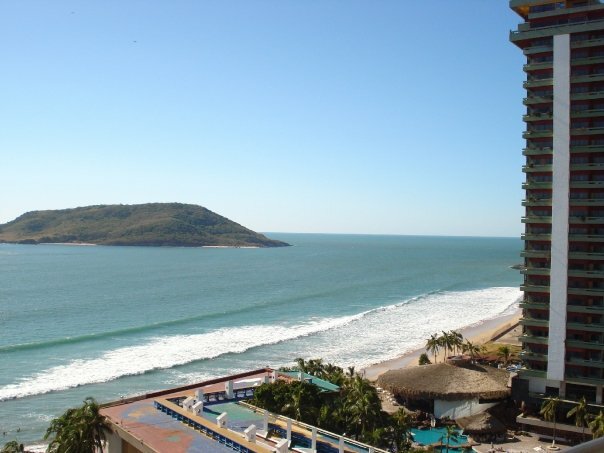 Here is the view of the ocean. So nice to wake up to this view! 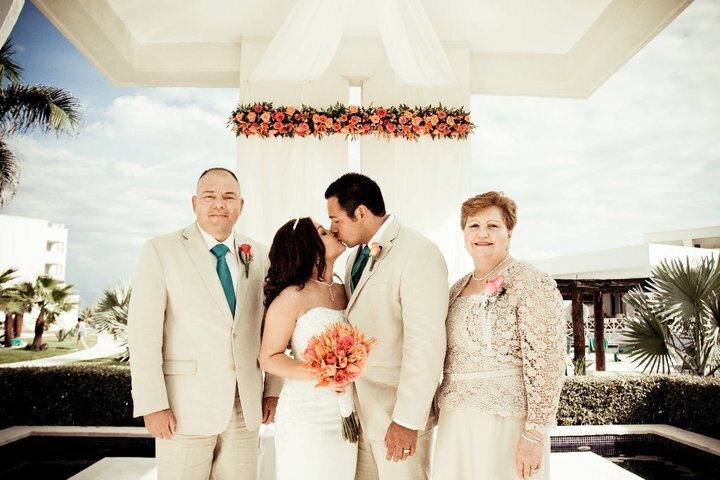 Then, since we loved Mexico so much we decided to have a destination wedding on 10.10.10 YEP, we did it on THAT DAY! 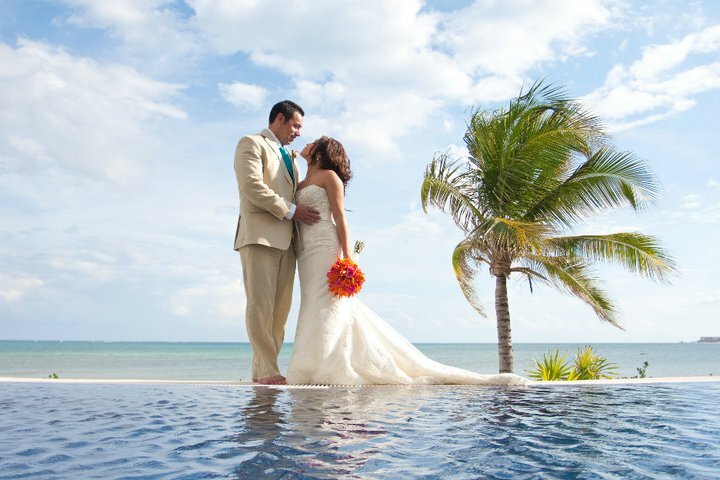 This time we went to the Riviera Maya…. it was heaven. We had such a great time – the resort was beautiful, the service was Class A, and we actually met some pretty cool people from Chicago who we still stay in touch with! People staying at the resort stopped to watch the ceremony and we felt like celebrities when random people would come up to congratulate us on our nuptials. 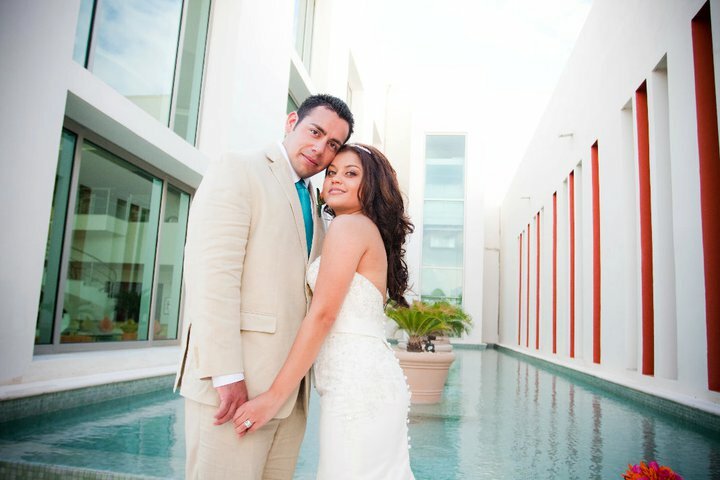 Here are a couple of wedding photos…. those are my adorable parents. And this is our favorite shot! Yep, it’s not photoshopped people, we were actually there!!!!! And then our princess arrived! Meet Natalia! 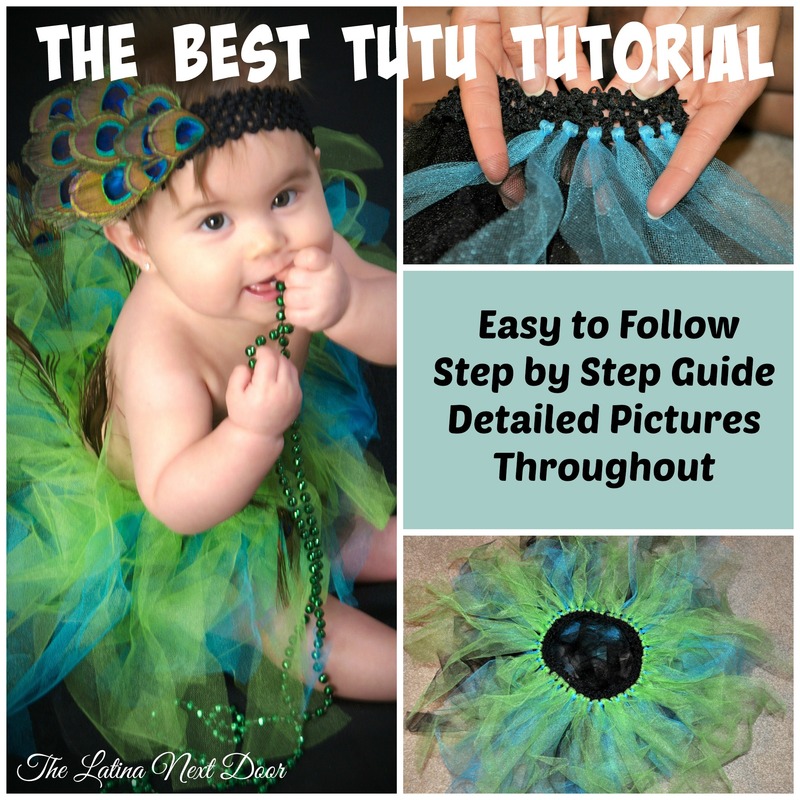 Yes, I made that tutu and the headband… DUH! 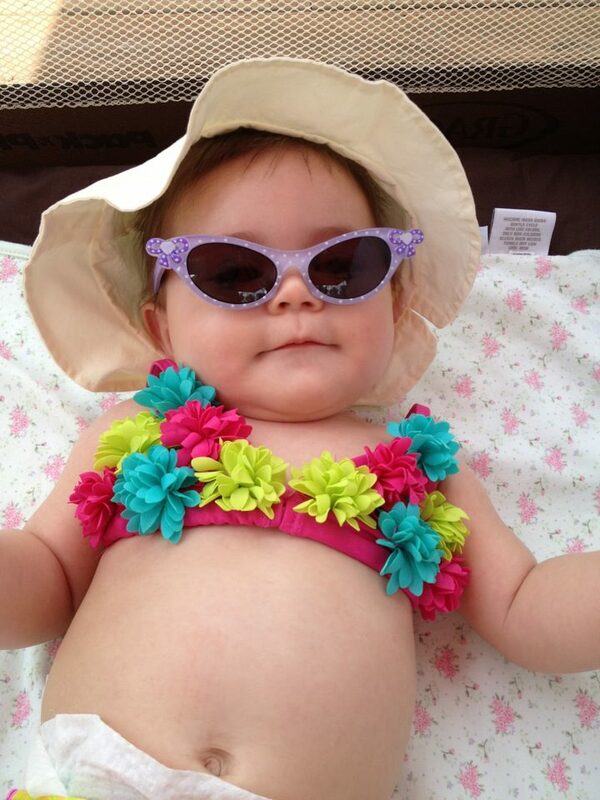 She loves the outdoors and has mommy’s fashion sense…. 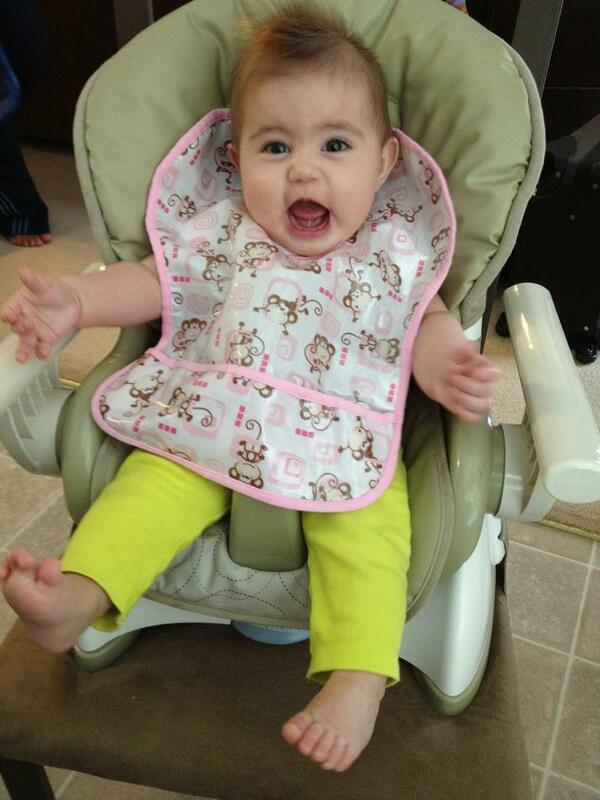 But she loves to eat just like daddy! 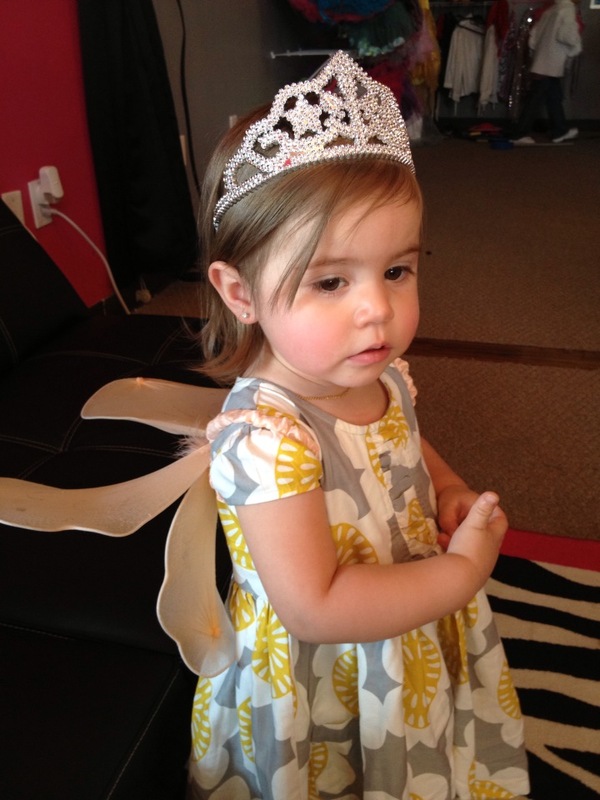 And now she into princesses, fairies and tiaras oh my!!!! 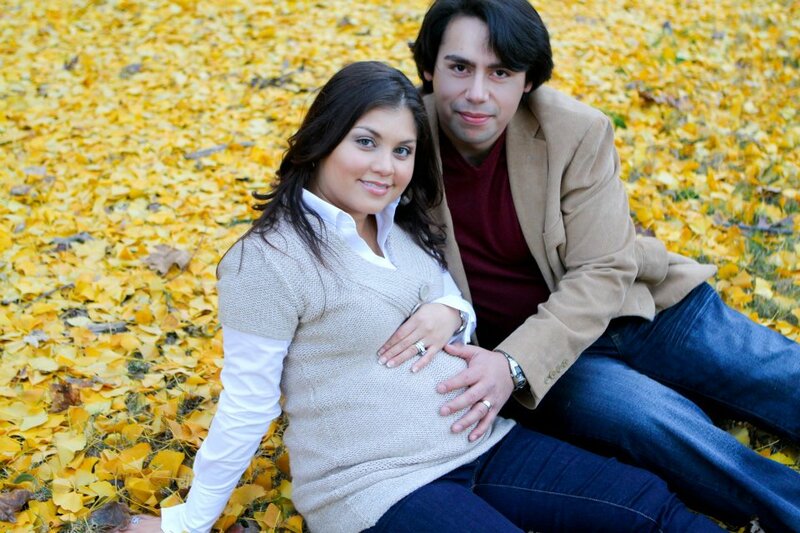 Well, not too long after we had Natalia, we found out we were preggo again… OOPS! But this time mommy didn’t look as hot while preggers. 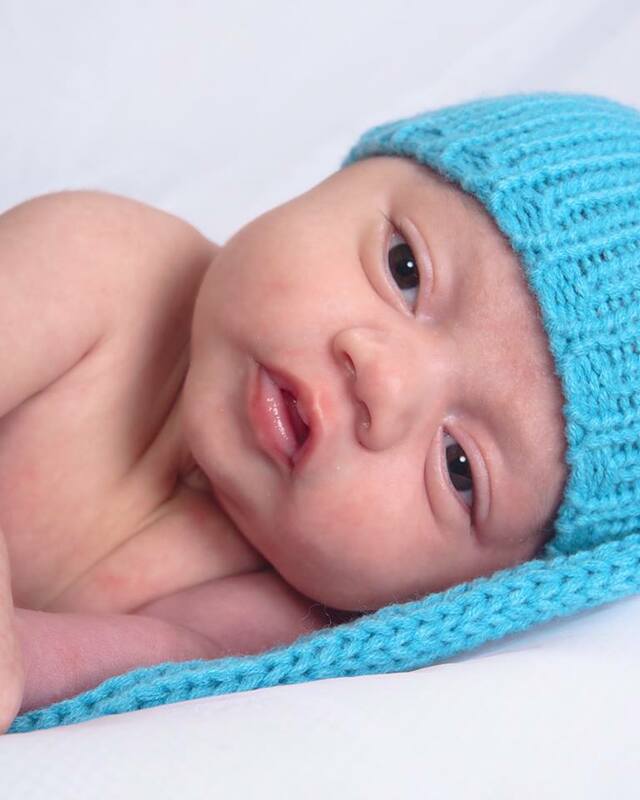 Plus were transitioning between homes and before we knew it, it was time to meet our little boy! This is our newest bundle, Achilles… yes, his name kicks A$$! 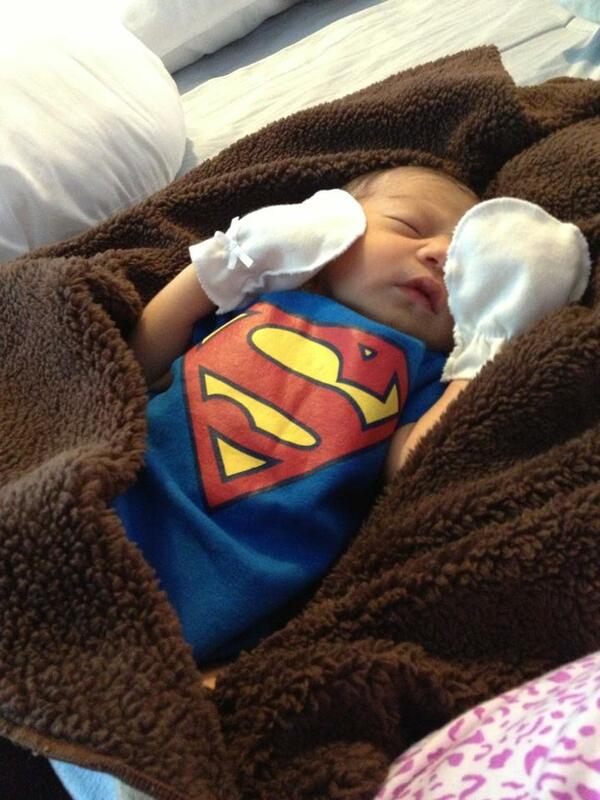 My hubby loves superman (and soccer)… so there will be more to come with his nursery….. It has been a whirlwind of 5 years, 3 of which we have spent married. I am truly blessed to have a beautiful and healthy family and look forward to a lifetime of excitement with these 3 individuals… More babies, you ask? Not for right now, but you never know what might come our way! I love you honey! Thank you for all you have done for us! Happy 3 year anniversary! So after moving while 9 months preggo with baby #2, giving birth to that beautiful baby boy and moving into what I like to call, “Leave it to Beaverville” I can finally start working on making our house a home. Our 5 bedroom, 3.5 bath on a full finished basement home is dying for some character, since the people who had been living in the house for the last 2 years were renters. The first thing we had to do was Natalia’s room. Our beautiful baby girl is now 20 months old and instead of buying whole new baby furniture for our son, we decided to give him her old set and buy her a new “big girl room”. This time, I wanted white on white on white! 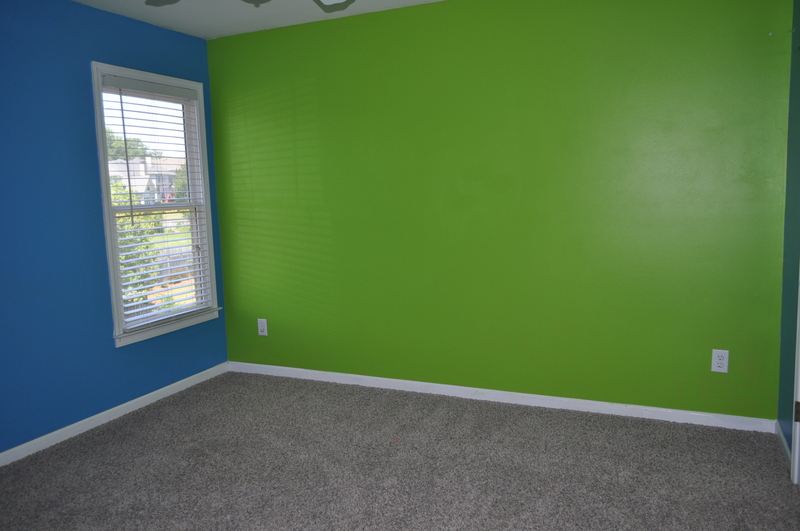 Before we had the furniture delivered we just had to get her bedroom painted. Just check out the before pictures… BLEH! 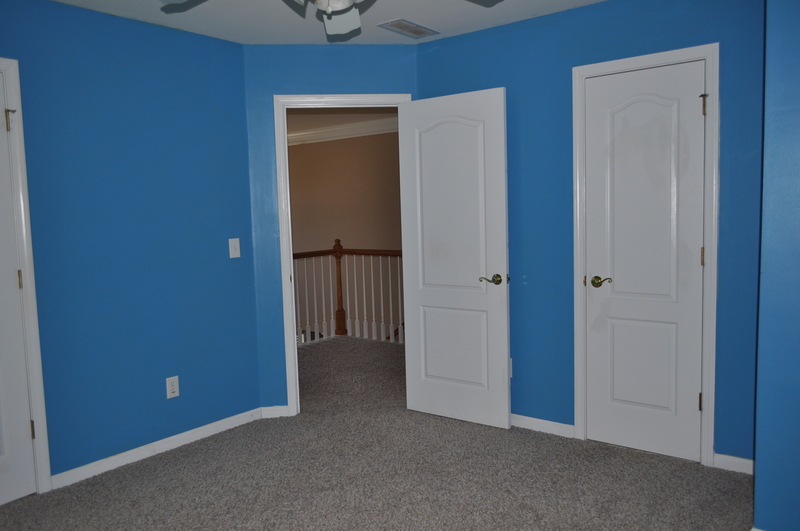 The door to the far right is the upstairs bath – we figured she would eventually want dibs on that. As you can see those were no colors for a princess! I decided to go with a light green, Sage Tint by Behr, only I asked the paint mixer person to make it 25% lighter to get this! Tadahh!!!! What difference paint makes!! We decided to get her a trundle bed. Since she is little and can fall off, we have her sleeping on the pullout bed. Then when she gets older she can move to the top and if her cousin comes over, Daniella can sleep on the bottom. 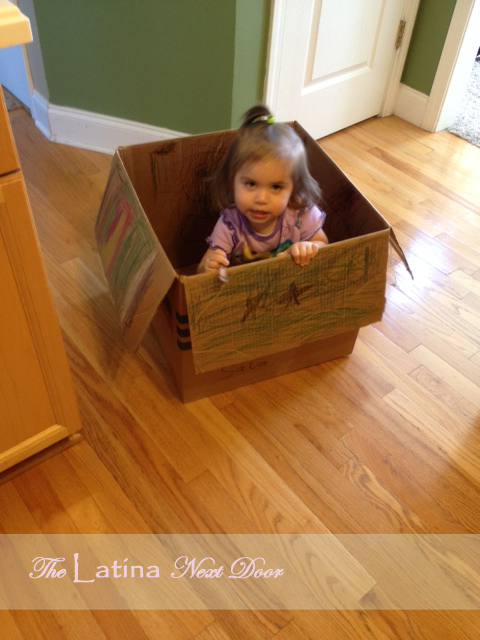 We thought it was the better solution than getting her a toddler bed or another convertible crib. So far she likes it and it seems to work! We think she could give this furniture some good use and could work well into her teens. Then it was off to add some linens and accessories. 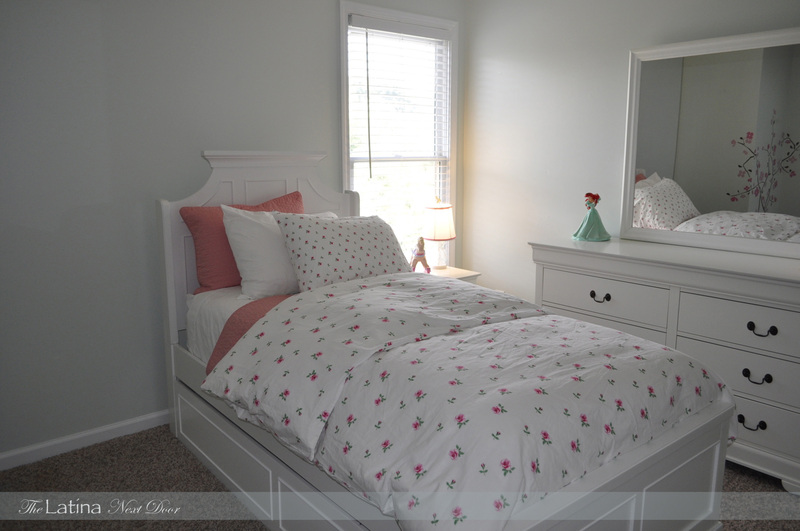 Since I had the trundle I had to get double of everything – I mean of course they had to match! I found some white cotton sheets at JCPenney and then headed to Ikea in search for some plush down comforters. I LOVE DOWN!!!! I had to make sure I did this when she was not around, because if she knew these were stickers, half the tree would be missing by now…. And here it is with the trundle out and ready for Naty! 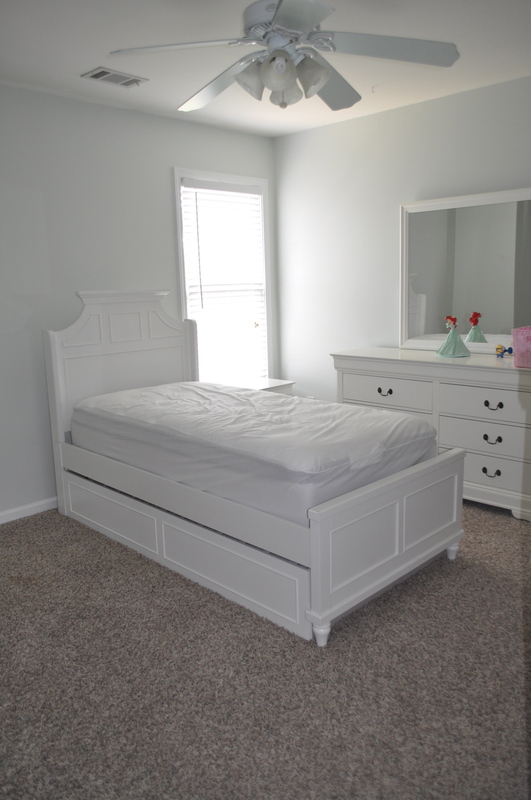 There is still a ton of stuff to do, like touch up the ceiling, add art and some really cute baby pictures, organize her closet, add curtains, decide what to do with the light fixture…. Whew! 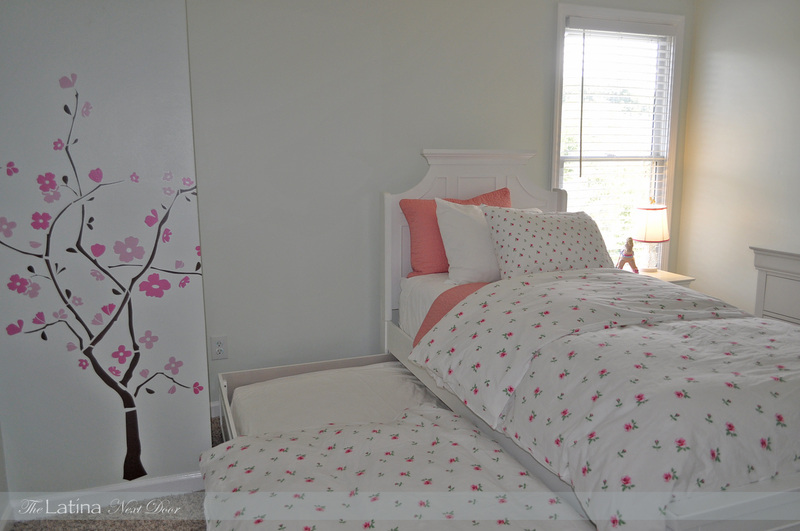 But at least for now she has a really cute princess bedroom in the making…. Hope you like! 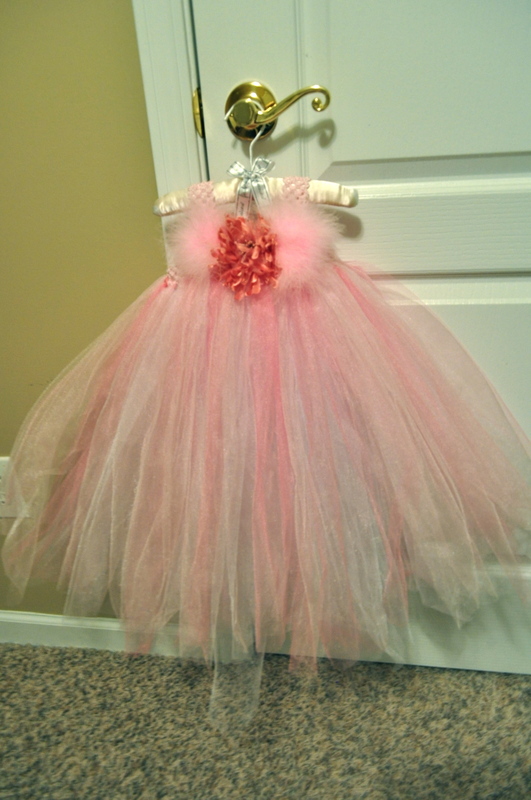 Ever since I knew I was having a little girl, all I wanted to do was make her tutus! 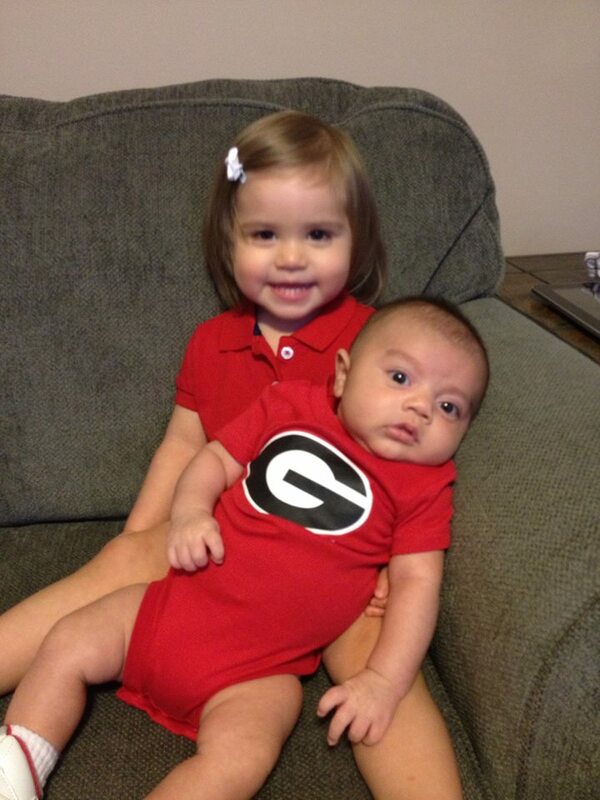 I think they are SO adorable and maybe, just maybe, I am living a little vicariously through her. All I know is that one day she will either thank me for always making her wear them or resent me for it…. for my heart’s sake, I hope it’s the first one. Well, this is the first Halloween since we had our little munchkin and besides getting her pictures taken in the “Pumpkin” outfit, I knew I also wanted her in a tutu. There are so many options and color combinations out there! But, for the sake of not being too girly, and also not doing the generic black and orange tutu, I opted for a Peacock version in beautiful blues, greens and black! 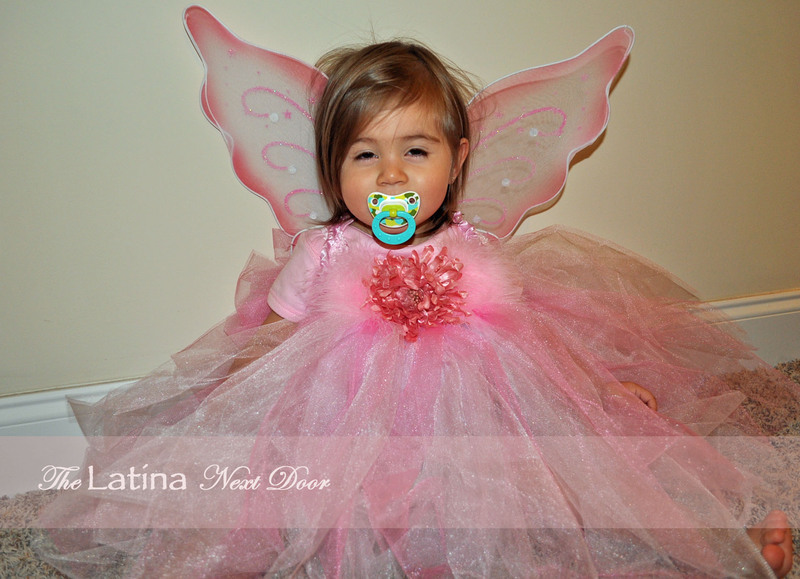 [Read more…] about TuTu Cute for Halloween! My grandfather is very ill, and the last time he came out to visit us from Puerto Rico, he bought my dad these outdoor chairs. It was the last thing he bought my father before he became too ill to travel back out of the island. My father’s work travels took him away from home and after a couple of years the chairs took a bit of wear from constant exposure to the cold winters and the hot summers, but since the chairs were of so much sentimental value to my father, he never wanted to get rid of them…. So, I had a bright idea. 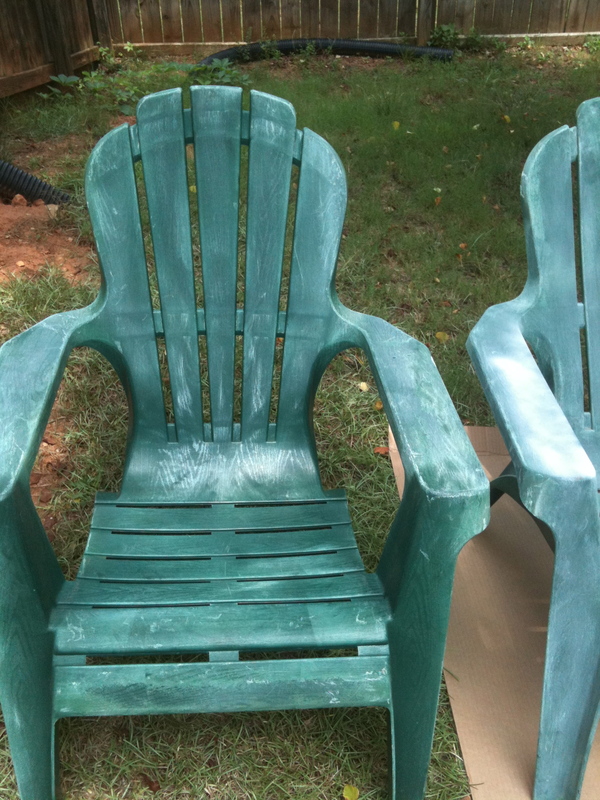 This past Father’s Day, I wanted to make sure my dad got something really cool, so I thought I would fix the chairs up for him. Originally they were a set of 4, but one was broken and too hard to fix, so I dedicated myself to the remaining 3. This is what I had to work with. I took out my primer and started spraying away. 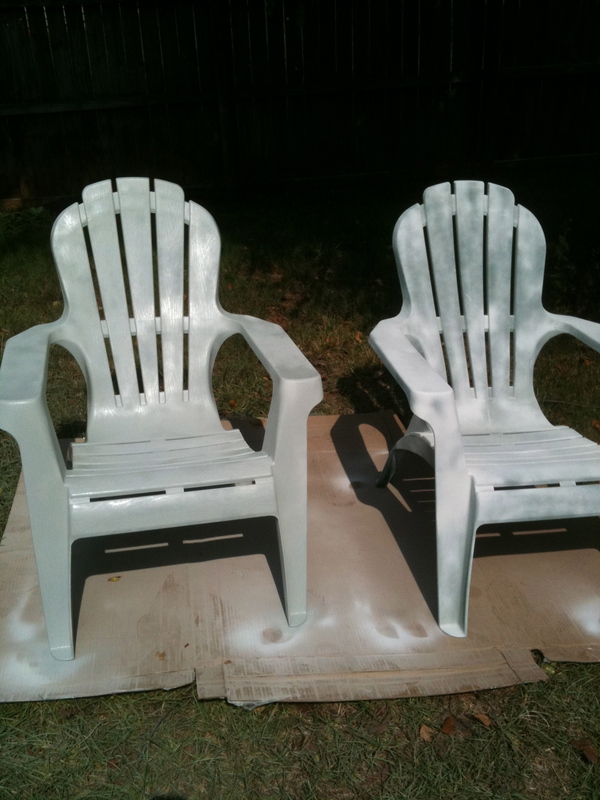 The chairs took a TON of primer and paint since they were so dry. I ended up using 6 cans and one clear top coat, but it was so worth it. 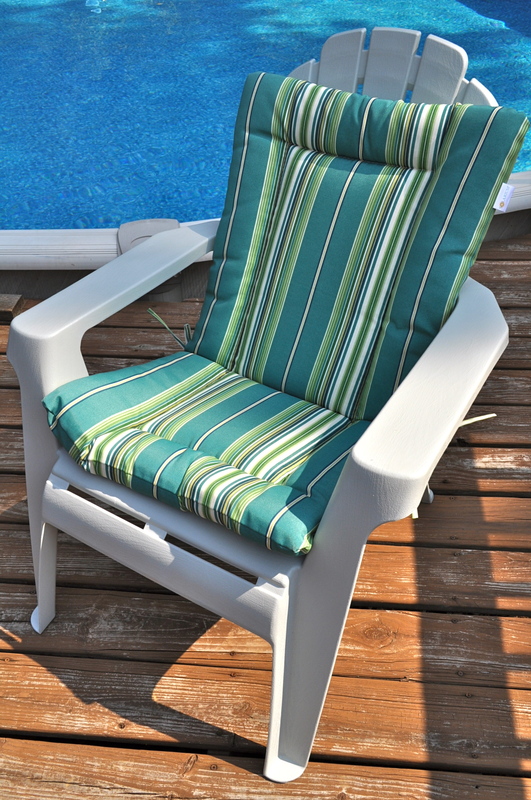 Here is one of the chairs with only one coat of paint. 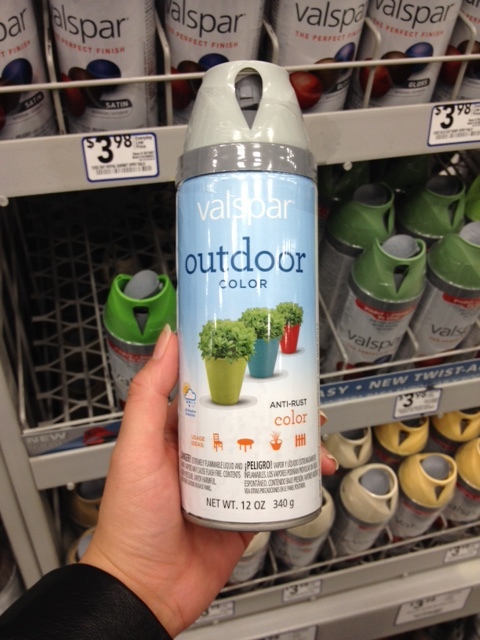 I painted it Jellyfish Gloss by Valspar outdoor paint. Here is what the can looks like. 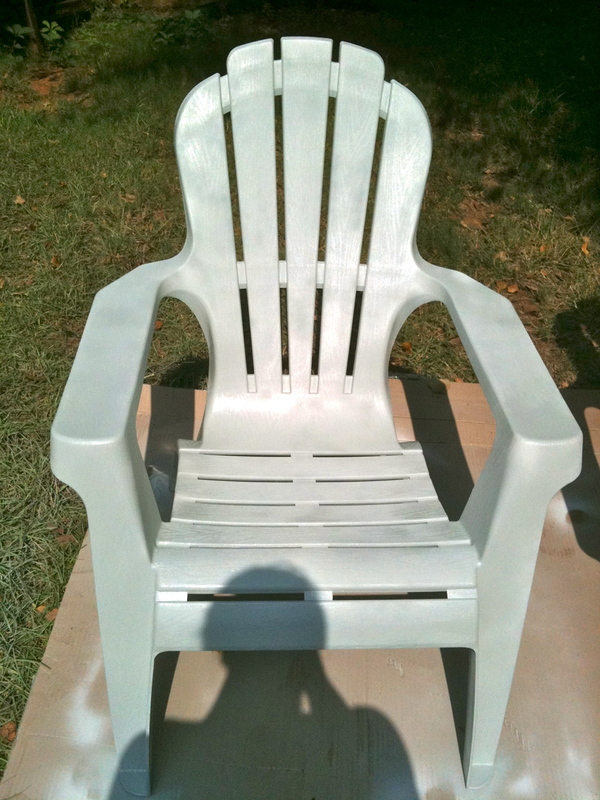 Below is the chair with the first coat of paint. Don’t mind my big head in the picture. Ha! When was the last time you actually made something for someone instead of buying them something… Or brought something back to life? The satisfaction is immeasurable! Isn’t it frustrating when you go to your local crafts/home decor store and you find something you like, but it’s the wrong finish or the wrong color, so you opt not to buy it???? Well, my friends not anymore! 2 things I am always stocked up on are primer spray cans and spray paint. DUH right!?!? 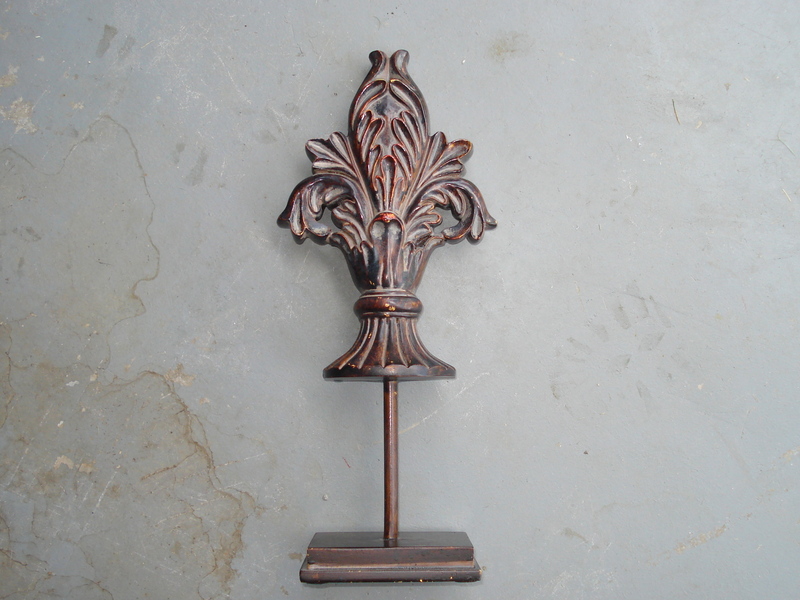 Lately, I have been getting a lot of inspiration from the French Provincial style and I found this really cute fleur-de-lis at my local Hobby Lobby marked down from $19.99 to $6.80…..SCORE! But the color was horrible and it had several scratches here and there, obviously from constant rejection and finally being throw into the clearance pile. 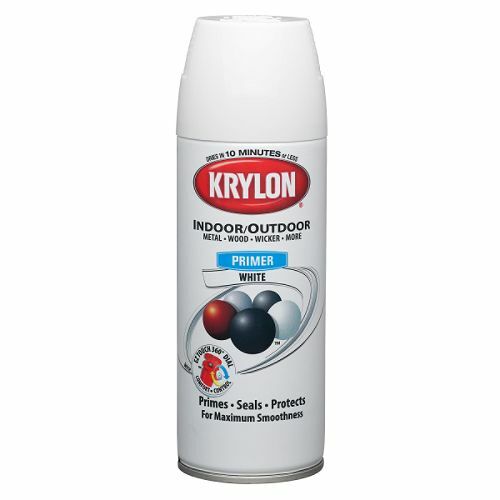 Luckily I had my trusty Krylon multi-surface spray primer “in stock” so I couldn’t wait to get home and prime my little heart out! It works on EVERYTHING! 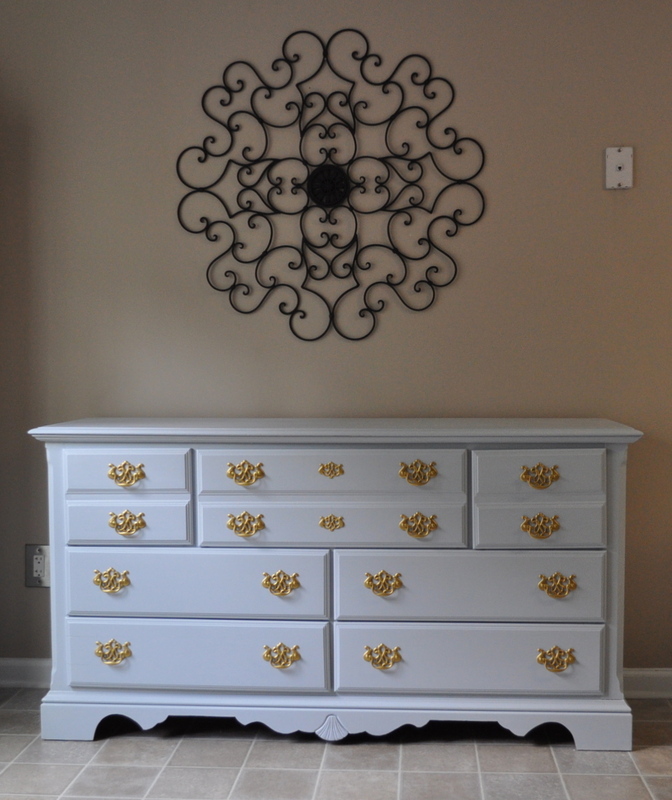 I wanted this to go on my dresser in the master bedroom. My bedroom set is an off white color so I looked around my Lowes and I found the perfect match! American Accents Heirloom White (I’m in love). I have used this on a couple of other things as you will get to see. You will also see that I have a fascination with the color white…. YES, I KNOW! I am a parent with a little one, but she will just have to learn not to put her dirty little fingers on mommy’s nice white furniture, and white towels, and white fabrics……. Baby-proofing is going to be a @#$%^&! After letting it dry here is the finished product! And here it is on my dresser. I must say, it helps keep my jewelry looking nice and not just thrown there when I get home from work. I like how it just dresses up the corner of my dresser. So ladies, here is your take-away…. just because it is not the right color, doesn’t mean you can’t buy it! I wanted this really cute lamp for my baby girl’s nursery, but I wanted it to be either glass or crystal and right now those are just too over-priced! I was looking online for inspiration and I saw something that caught my eye. 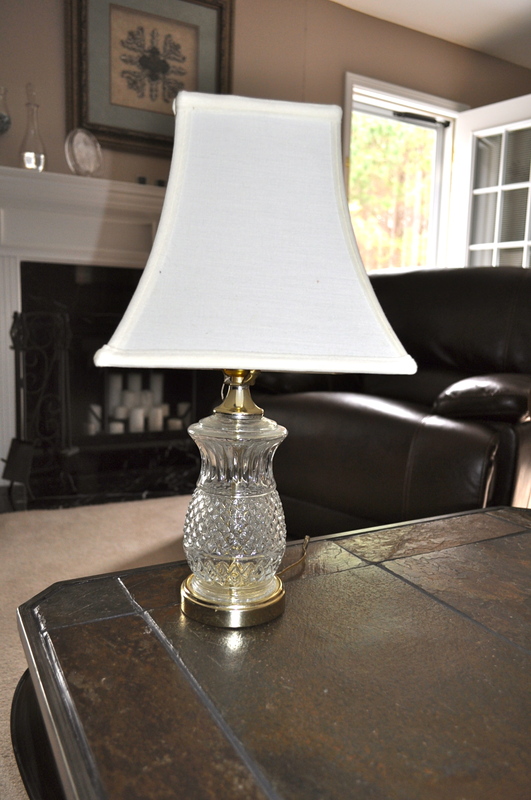 It was a makeover of a crystal lamp! I knew I wanted something semi-traditonal, with a little bit of contemporary and a girly twist of course. So, I headed out to an antique store about 30 minutes away from home in search of the perfect find! And this is what I found for only $8.00 (please note: always make sure they test any electrical items at an antique store before buying – you don’t want to take it home and it not work!). I could have sworn I took photos of when I taped it up! But I searched and I can’t find them anywhere! 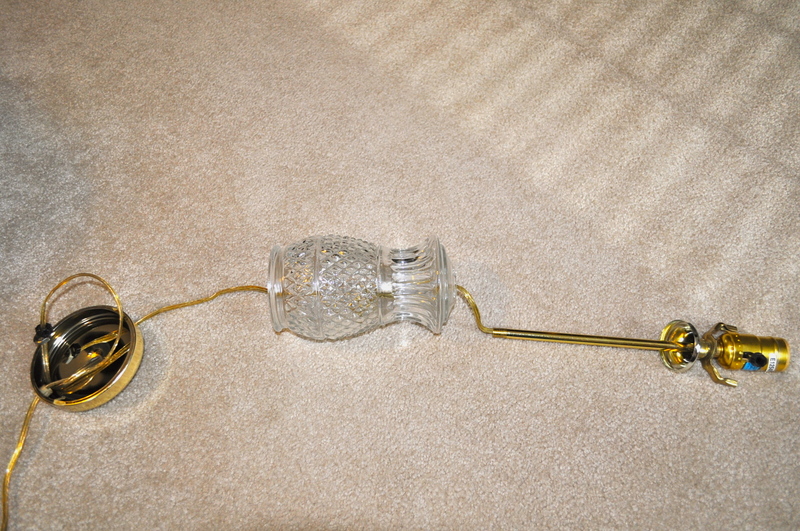 So, anyways, I taped the cord and the glass and only left the metal portions of the lamp exposed. 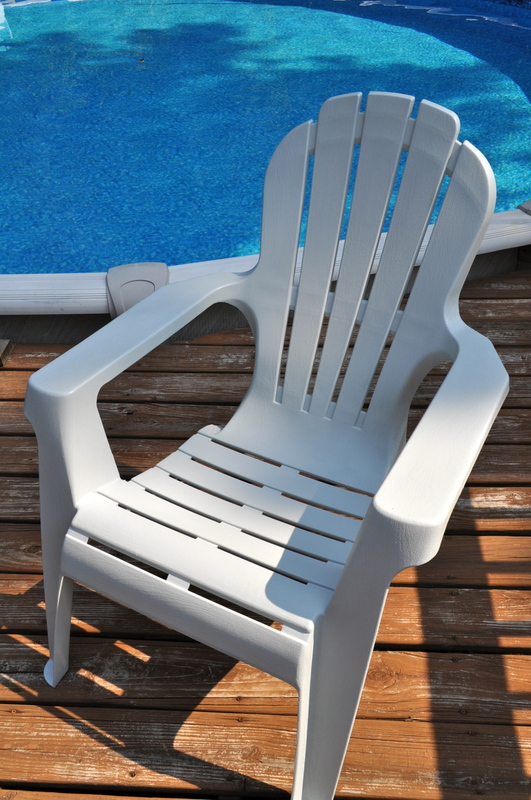 I primed with Rust-O-Leum’s metal primer and then I spray painted it with Rust-O-Leum’s gloss white. Then I went to my local Garden Ridge in search of a new lamp shade. 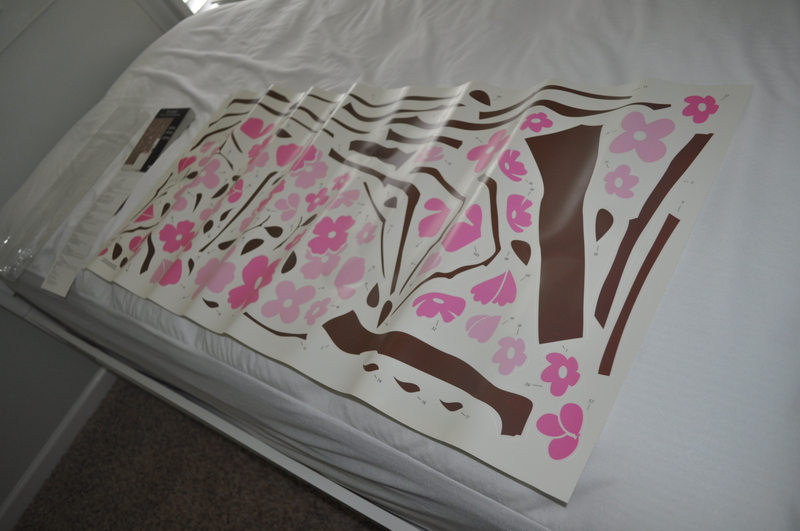 And I found a white one with a hot pink detail for only…. $6.00! I screwed all of the pieces back together, put the new lampshade on and viola!!!!! 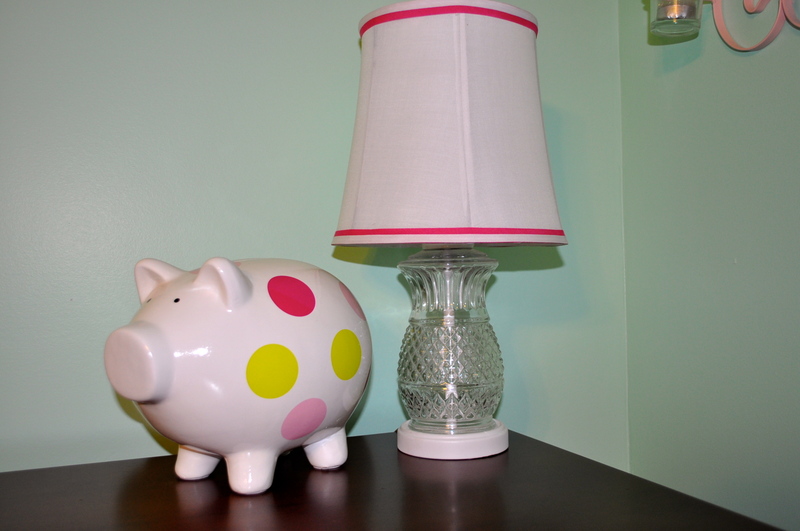 A new one-of-a-kind lamp for my baby’s room for only $14.00!!!!! I absolutely love it!!! Totally cute! What do you think???? Okay, so I have become a major Craigslist JUNKIE! There is no 12-Step program for this addiction yet, so in the mean time I will enjoy basking in the delightful high that you can only get from buying furniture a-la cheap! 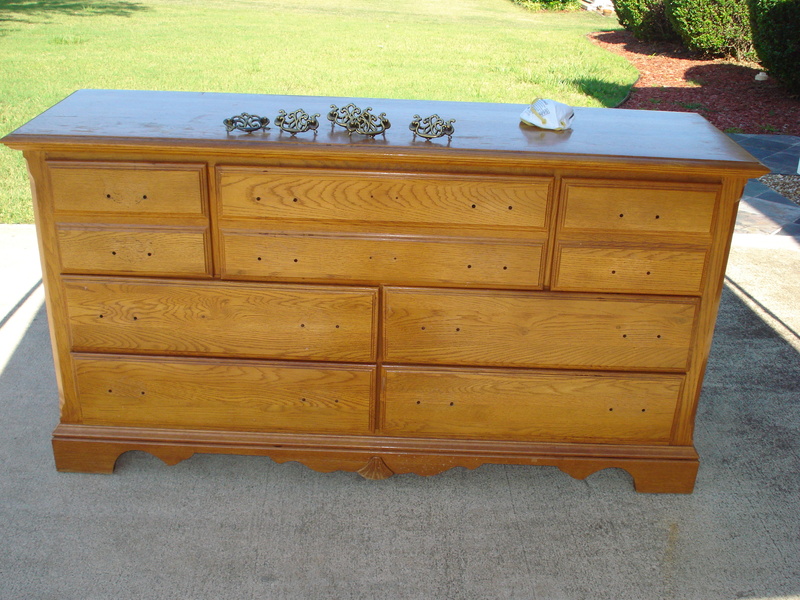 So, please meet sad dresser #1 that I scored for only $30!!!! The owner wanted it no mas and I was glad to take it to a loving home. The look on my hubby’s face was priceless when I said I wanted to buy it! But deep down inside I knew he had FAITH. I apologize for not having a picture with the hardware on it, but I did get a close-up of those tarnished old things. You can see all the scratches on the surface of the dresser. First thing’s first – I removed all of the hardware and sanded it. It had received a little wear and tear over the years and even though I was not able to take all of the scratches out, I made it look MUCH better. 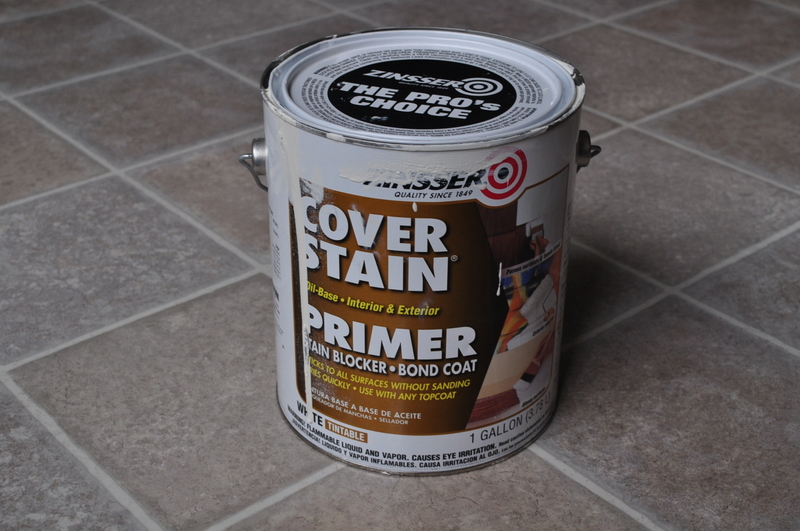 After a TON of research on the web and bombarding my local Home Depot paint sales clerk I primed it using the best primer out on the market: Zinsser Cover Stain Oil Based Primer. 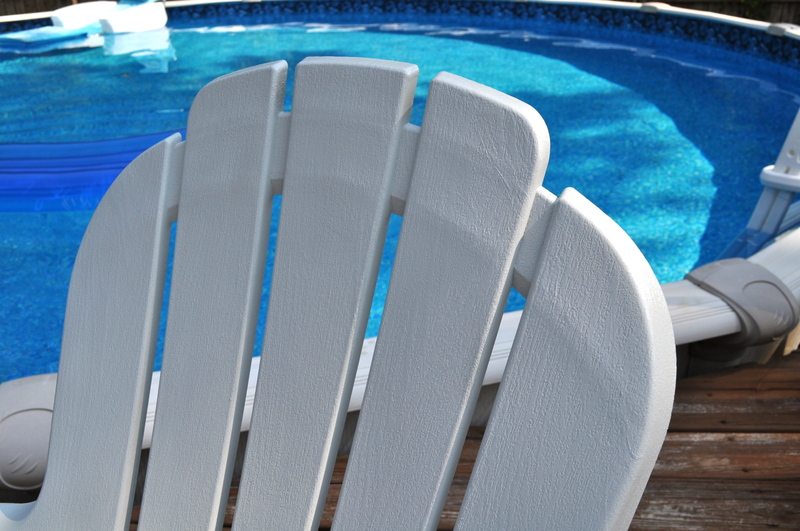 Note: You can prime a piece of furniture with oil-based primer and then paint over with latex paint, but you CANNOT prime with latex primer and then paint with oil-based paint. Comprendes???? This is what the can looks like. 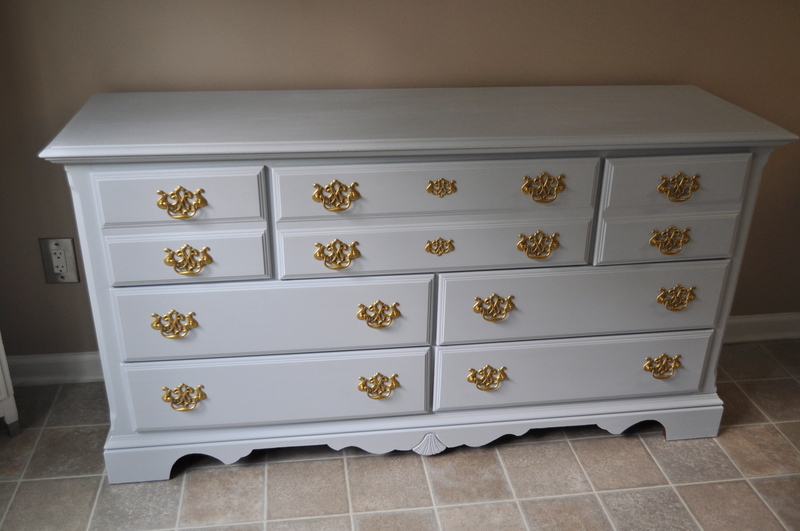 I gave the piece 2 coats and gave it a light sand once it was dry. I will also add that the products I list here are products I have read about, tried out and have come to like. 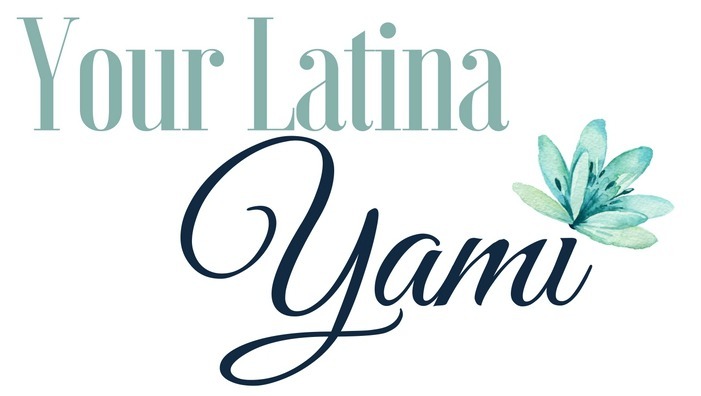 I am not being paid to advertise – I am just sharing with you the products that I have used and have come to prefer. 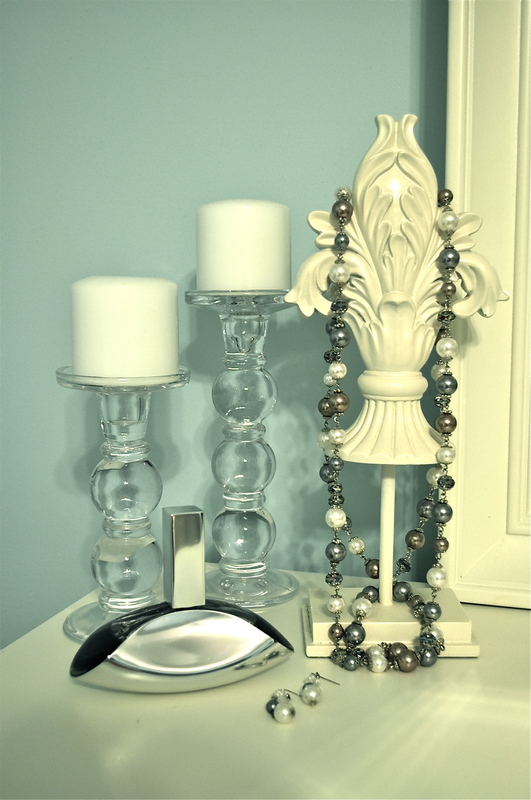 Back to business… Okay so I am really into grays, blues and light greens and I found the perfect shade of grayish blue: Antique Silver Premium Interior Paint by Glidden. I chose a semi-gloss because I wanted a smooth easy-to-wipe surface with a little bit of shine. I did 3 coats of this just because I really wanted a thick and smooth surface. 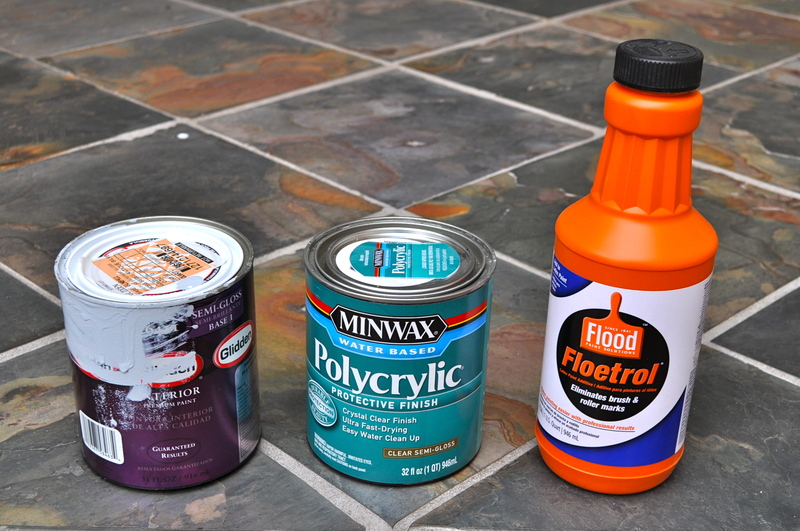 One tip: I use this product called Floetrol – it is a paint conditioner and it comes in an orange bottle. This can only be added to latex base paint. 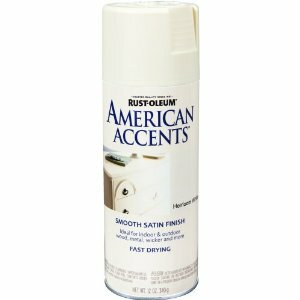 It is supposed to make the paint much smoother and reduce brush marks. It also allows the paint to dry in a much slower time (in case you are painting in your garage in the middle of summer!). This helps when the paint is really thick too, which is usually the case with enamel paint. If you want a good paint job, then use this with your paint – TRUST ME. See inventory below! Tools: I used a 4” foam roller. You don’t need a big one since drawers aren’t really wide. They cover well and they apply paint better than a paintbrush since they don’t leave streaks. 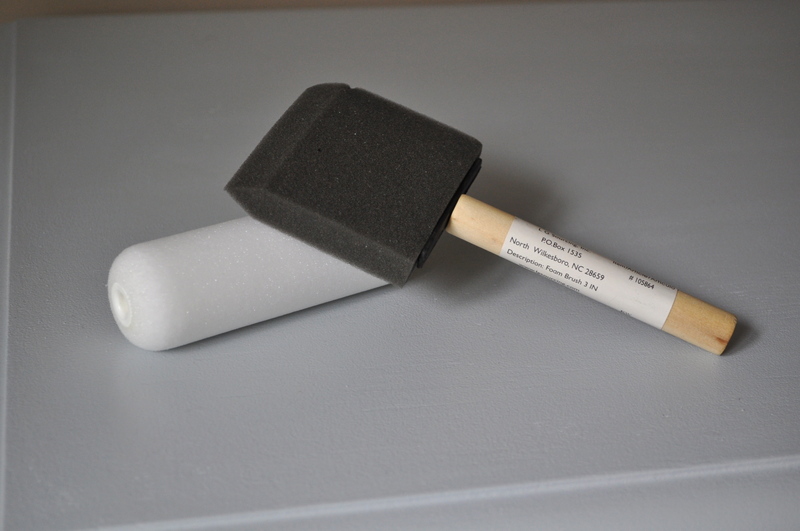 For the corners and crevices I use the small foam brushes that are CHEAPO (both shown below). Always remember to allow at LEAST 24 hours for your paint to cure. NEVER rush or you will spend twice the time fixing what you did wrong. It can get very tempting to rush, but DON’T DO IT. The end result will be so worth it if you just wait! 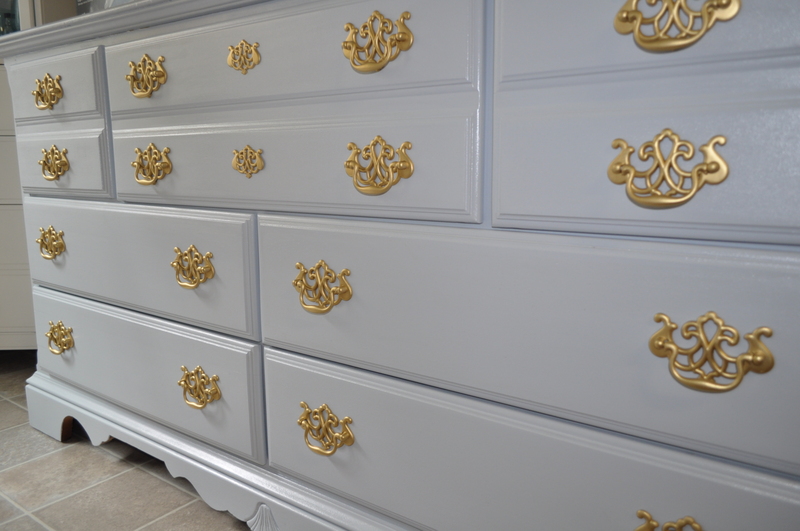 The final step for the dresser paint was to add a sealer. 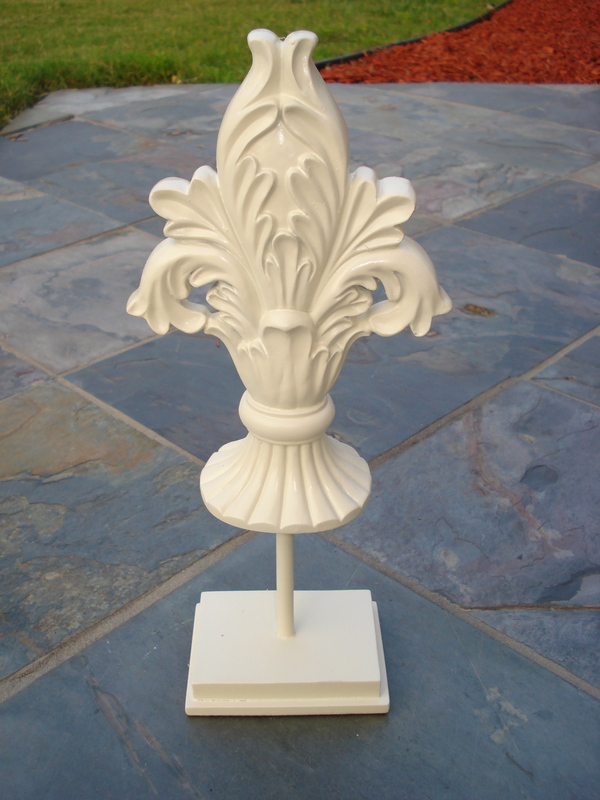 I used Minwax Water-Based Polycrylic Projective Finish in Clear Semi-Gloss (also shown above). I wasn’t sure how much “traffic” this piece was going to receive, but I did want to make sure it would take a lot of wear and tear so I did 2 coats of the sealer. NEXT came the hardware. 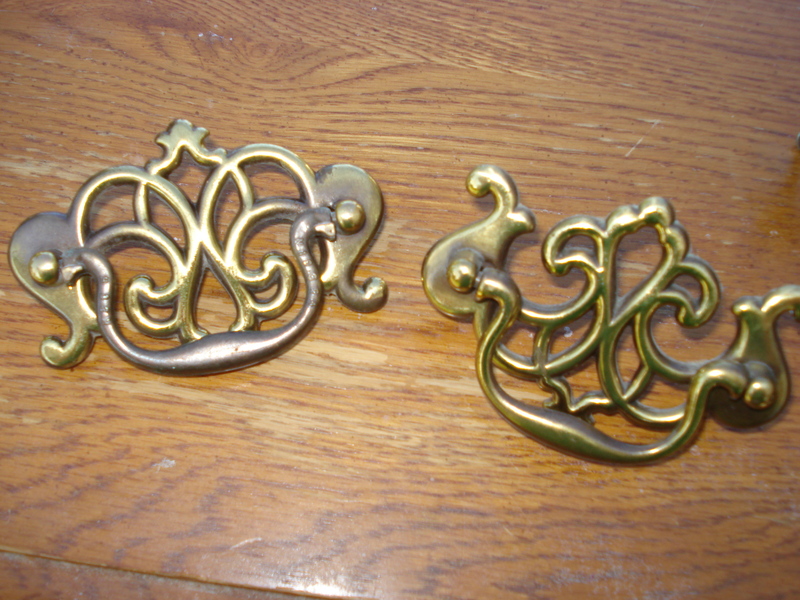 I REALLY wanted to restore the brass knobs, but after over 20 hours of backbreaking buffing and several failed attempts to strip the tarnish with chemicals, I learned I was getting nowhere fast… so I said FORGET THIS! I raided my spray paint stash and pulled out some Minwax Water-Based Polycrylic Projective Finish in Clear Semi-Glossand spray painted the crap out of them! 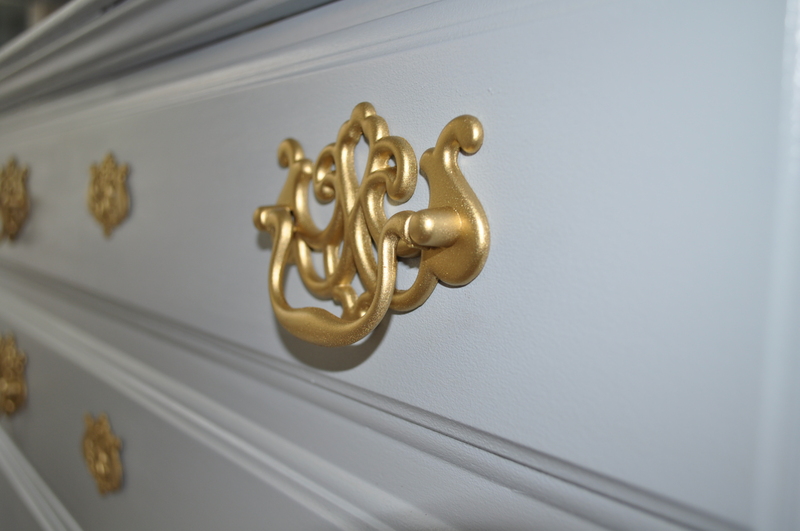 Then AFTER letting them dry for 24 hours I used Krylon Short Cuts Gold Leaf Spray Paint. I ended up using about 3 cans, but it was worth it. Check it out!!!! Here is a close-up of the hardware…. I currently have this in my dining room and it doesn’t go with the wall art, but here is what it looks like from afar (I am also learning how to take better pictures with my Nikon, so bear with me!). I just can’t help myself! Here is another angle! I love the Modernized French Provincial Style -totally me! I am very proud of this piece. Hope you enjoyed! I have about 14 other pieces in my garage waiting for a face-lift and I can’t wait to share the transformations with you. Wanna see this post translated?